February 14th is St Valentine’s day. It is also the day we celebrate the patron saints of metadata. 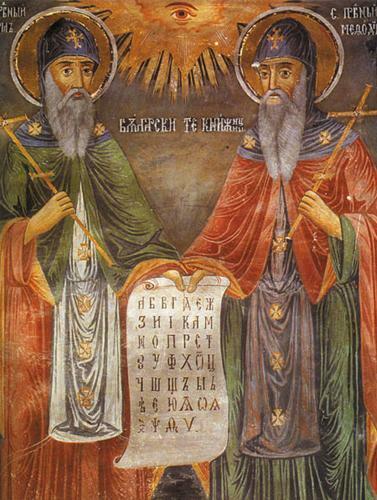 Commemorated on this day are a pair of Slavonic brothers Saints Cyril and Saint Methodius who are the patron saints of data management. Cyril and Methodius began translating the Bible in the 9th Century but ran up against the problem of the lack of a suitable alphabet. This is a common research problem: They had access to a substantial body of important information; they wanted to share this with a wider audience, and to ensure that it was transmitted accurately and preserved for posterity in a way that would be easily comprehensible. When they found that no existing encoding system was adequate for the task, they set about developing a new one. Undeterred, Cyril invented a new coding system. He invented a new alphabet. His work formed the basis for Cyrillic, still widely used today. Methodius ‘s name was actually Michael but he changed it to reflect his key research priorities: persistent pursuit of truth conducted in an orderly and methodical way. How many among us now are so committed to our research that we would change our name? Do you want to learn how to write for the world’s largest encyclopeadia? Do you want to make knowledge available for the whole world to share? Do you like eating biscuits, meeting new people and having fun? Building on the tremendous success of last year’s Innovative Learning Week Wikipedia editing extravaganza, we invite all to once again come along and join in. The focus of this years’ event will be on the History of Medicine. You don’t need to know anything about the subject to participate. Suggestions of topics to create or edit, along with supporting resources will be available, and training will be provided by a professional Wikimedian. If you have a laptop or tablet, please bring it along. Picture taken by me at Edinburgh Napier, Craiglockhart. No rights reserved by me. After a quiet time in the last couple of years Girl Geek Scotland relaunched in considerable style last night with a keynote address by Nicola Sturgeon. Edinburgh Napier University have offered them a home and the Principal, Andrea Nolan and the Dean of Computing, Sally Smith both spoke about the role women do play and should play in the tech sector in Scotland. We are only 18% it seems, so even though there are no shortage of well paid, interesting, rewarding, professional jobs out there, the guys are still getting them all. I am very pleased to see both Ada and Mary getting some long overdue recognition: Ada on the passport and Mary on the RBS tenner. Picture taken by me in my house. No rights reserved by me. ISG is an organisation with a diverse workforce. As the first in our ‘PlayFair Steps‘ equality initiative seminars we invited Wendy Loretto, Deputy Dean and Professor of Organisational Behaviour at University of Edinburgh Business School to talk to ISG staff about ‘Understanding age in the workplace’. Wendy’s main research field is age and employment, with a particular focus on changes in employees’ and employers’ attitudes and practices in extending working lives. She gave us an overview of the issues, challenges and opportunities and brought critical insight to this topic questioning some of the rhetoric and assumptions that underpin much of the policy and mainstream management discourses. The session prompted group discussions amongst ISG colleagues and suggestions for real changes to move us towards working inclusively.